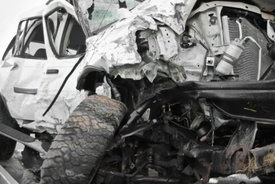 Legal news for Massachusetts SUV rollover attorneys – An SUV rolled off the road 50-feet below into embankment. Falmouth, MA (NewYorkInjuryNews.com) – A driver failed to negotiate a turn when her SUV flipped over and rolled 50-feet down an embankment Tuesday, February 2, 2010, according to WHDH-TV. Falmouth Police Department reported to the scene where the SUV rolled off Falmouth Heights Road, crashed through the guardrail and struck a tree before coming to halt right before plummeting into the ocean near Vineyard Sound. The accident occurred at 10:30 a.m., when the injured female driver soon escaped from the sunroof of her wrecked vehicle and called 911. The SUV driver was identified as 48 year-old Deborah Moore, who miraculously only sustained minor injuries in the crash. Police are not sure what caused Moore to go off the road. Emergency medical services (EMS) arrived and transported Moore to Falmouth Hospital, where she was treated and released by medical officials. Police reported that Moore’s seatbelt likely saved her from more serious injuries. Her SUV was completely damaged and bent inward in the front. Clean up crews arrived to pull Moore’s damaged SUV from out of the embankment, which took hours. Police did not issue Moore a ticket for the SUV rollover accident. It was not reported if a medical condition or alcohol played a role in the crash. The investigation continues.